I created the artist’s book Tangential in response to a call for artists to view an old book and create an artist’s book that engages not just the eye, but also the hands for the exhibition Handy at the University of Iowa Center for the Book in the summer of 2017. 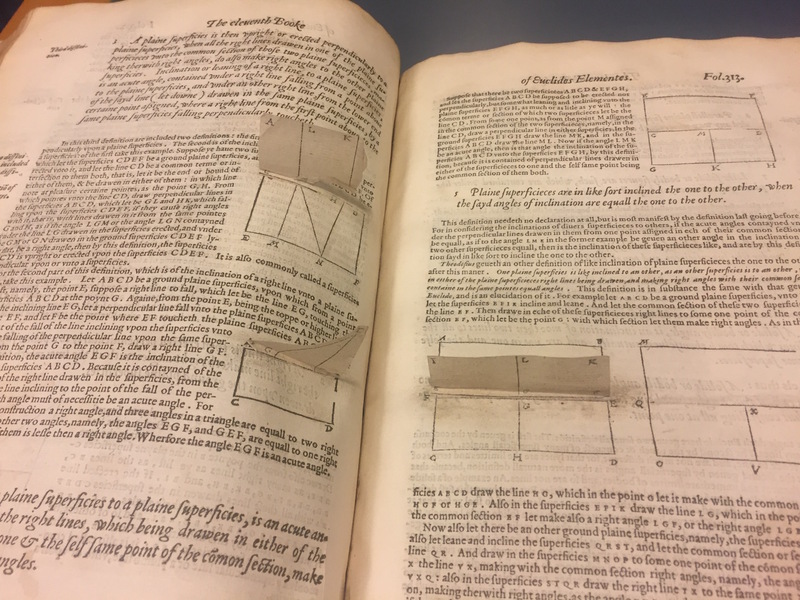 I was paired with Euclid’s Elements by Sir Henry Billingsley, who published the first English-language edition in 1570, and I viewed a copy at the Denver Public Library in Colorado, where I live. I was intrigued by a tiny paper flap, which was glued into a page of this old book, but there was much to be imagined, because this particular copy was in poor condition. I envisioned that other flaps must have fallen out of the book over the years, and presumed that the reader would have been able to construct sculptural geometric forms (like a tetrahedron) on top of the pages and then fold them back down before turning the page. 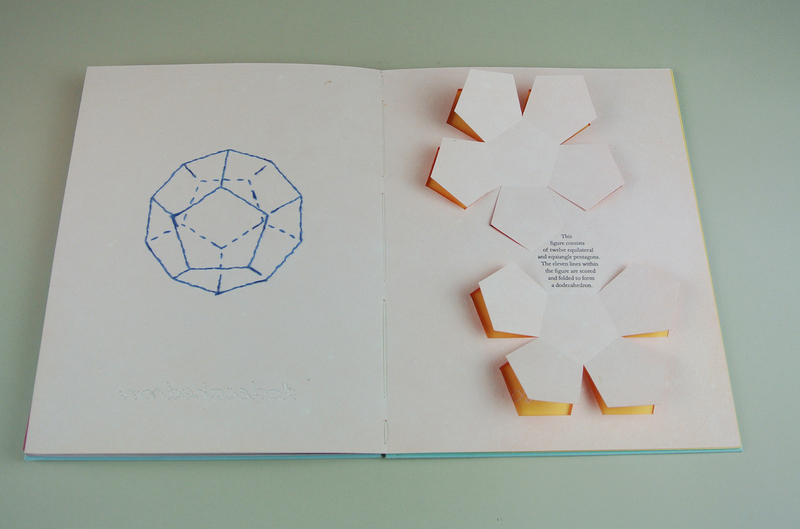 The flaps, in this book, were additive (shapes from another sheet of paper were cut out and glued into the book). 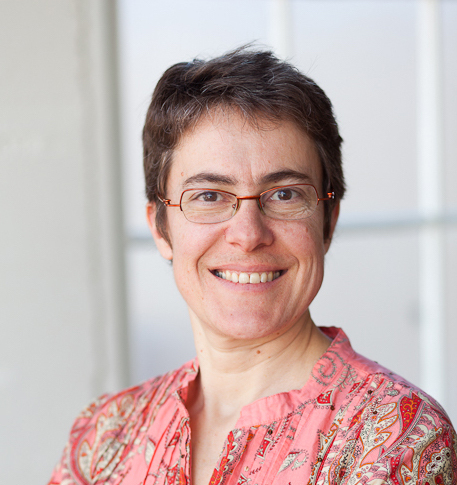 For many years, I have been interested in the ways that a flat sheet of paper can transform from two- to three-dimensions without the removal of any part of the sheet. 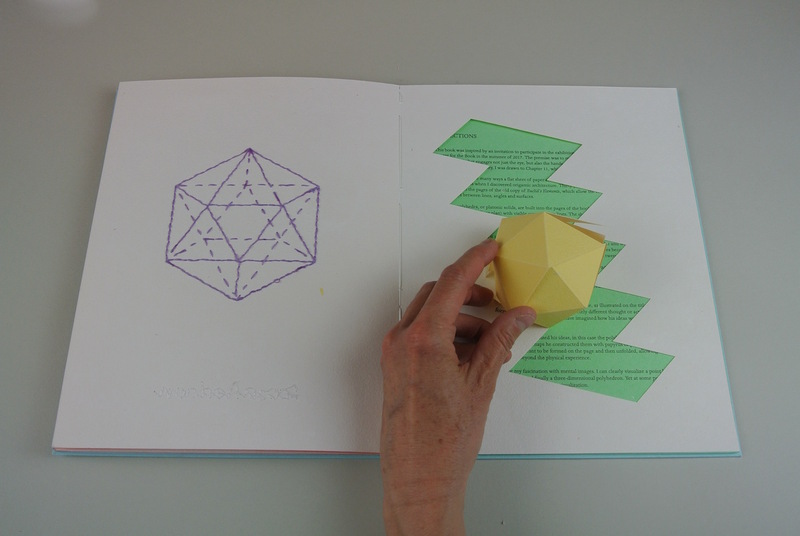 As one pages through Tangential, s/he encounters the floor plans for the basic polyhedra: each form lies flat on the page with visible cut and score lines and can be lifted from the page and constructed (but not removed) to form each of the platonic solids. I make paper by hand, so it seemed logical to create double-sided sheets. The color sequence flows through ten chromatic color fields, appearing sequentially. Tangential (2017), spine and box. The geometric shapes begin flat and white, but when folded into their solid forms, they appear as colored shapes. 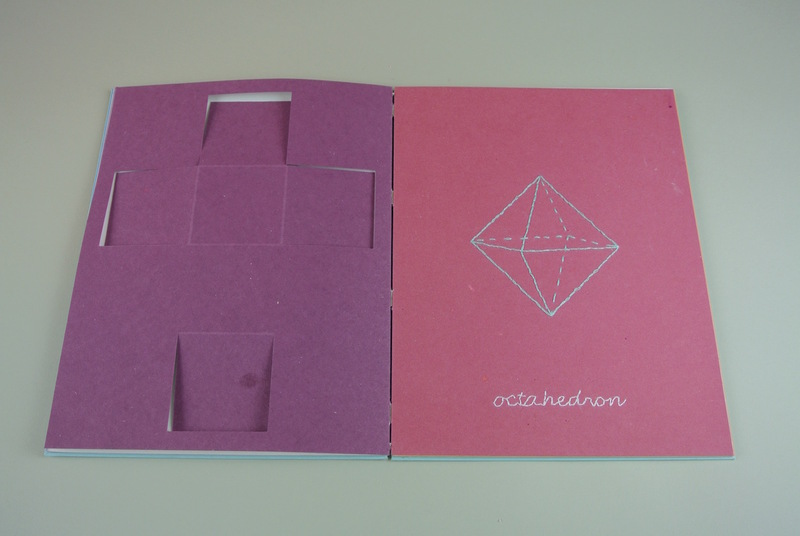 As the pages turn, the shapes become more complex, beginning with four triangles that fold up into a tetrahedron and ending with a twenty-sided icosahedron. Stitching is an integral part of my work and life (I knit, sew and embroider). When three-dimensional shapes are illustrated in two dimensions, the lines that lie in the background are rendered as dashed lines, which look like stitches. 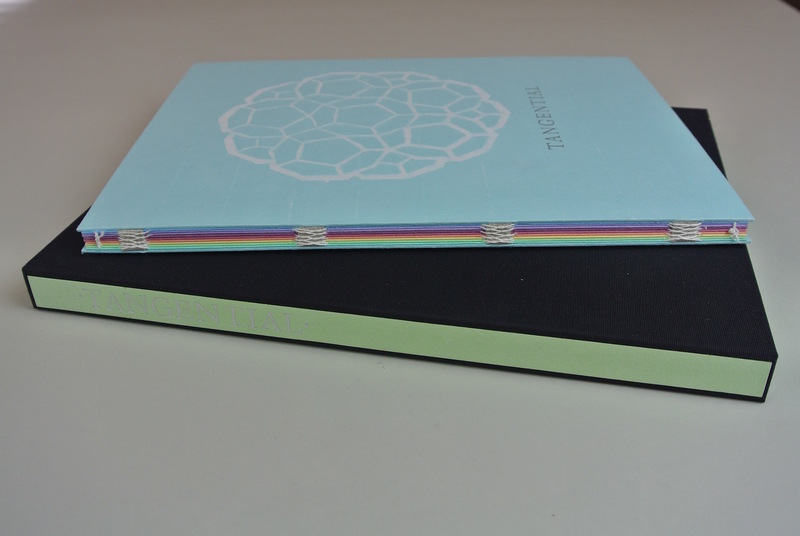 I hand embroidered the name and a flat rendering of each three-dimensional shape on the front of each folio. I enjoy the repetitive handwork, which allows me to interact with the sheets as I stitch, turning each page back and forth as I insert the needle time and again. I find it interesting to imagine how Euclid realized his ideas, in this case the polyhedra, in the physical world, since paper was invented after his time. Perhaps he constructed them with papyrus or parchment, precursors to paper. Creating this book allowed me to explore my fascination with mental images. I can clearly visualize a point becoming a line and then extending into a plane and finally a three-dimensional polyhedron. Yet at some point, putting pencil to paper and constructing a model helps with visualization. 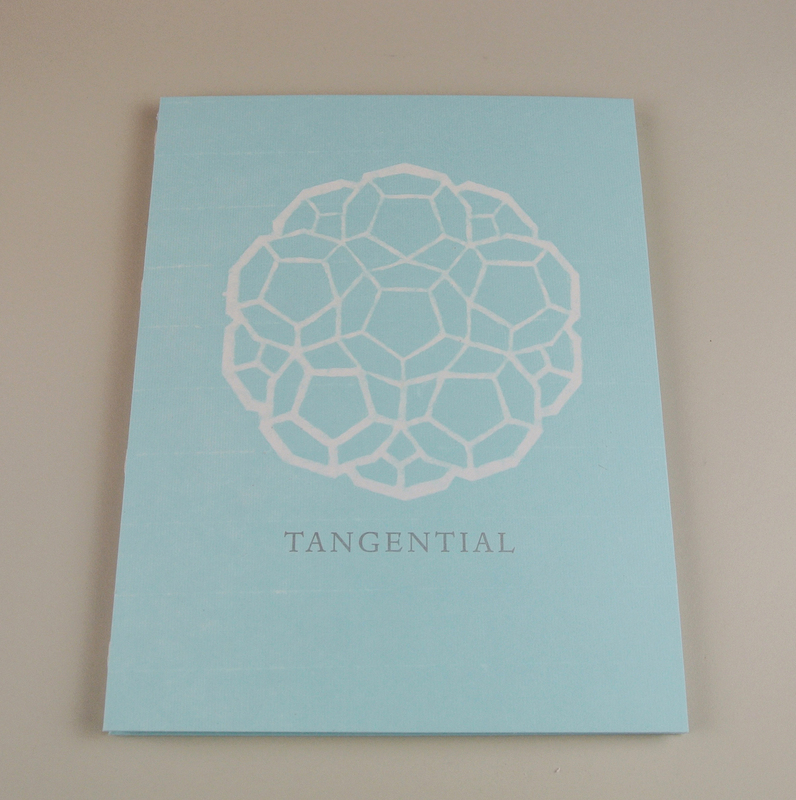 Tangential 2 from Helen Hiebert on Vimeo.